18.03.2012. Melbourne, Australia. 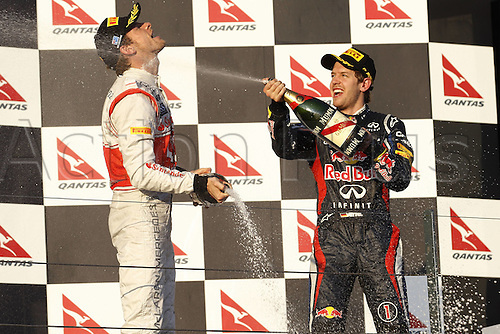 FIA Formula One World Championship 2012 Grand Prix of Australia Jenson Button GBR Vodafone McLaren Mercedes gets a champage shower from Sebastian Vettel ger Red Bull Racing Jenson Button won the race with Sebbastian Vettel in second and Lewis Hamilton in third place.